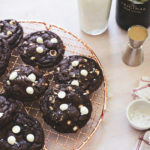 These chewy cookies are dotted with caramelized white chocolate and taste just like a fudgy brownie. YOU GUYS! 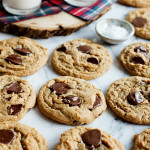 I have been holding out on these cookies and they are seriously one of the best cookies to ever come out of the oven. I have made them several times since their inception and they have been a hit every time. I shared batches with Sean’s office (he works in Parks and Rec for the city), my OBGYN’s office (she declared them the “BEST EVER COOKIES”), and with the nurses at the hospital when we checked in to deliver Luna. 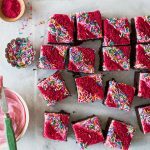 I realize that last one sounds insane–baking a batch of cookies on the cusp of delivering a baby–but they really are that easy (and I needed to occupy my mind in the hours before delivery anyway)! I wanted to make a cookie that was basically a brownie and Valrhona sent me a huge bag of their Dulcey (caramelized white chocolate) feves a few months ago just for funs and I knew they would be perfect here. 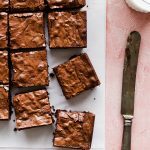 These cookies are chewy and fudgy, just like your favorite brownies, and best of all, are super easy to make and can go straight into the oven without any resting time. Plus, they keep for days in a container on the counter and still taste fresh and chewy. Whip it good! Whipping the eggs and brown sugar here is what makes these cookies have the perfect brownie-like texture and crackle. Be sure to beat them together until they are a pale, tan color and have doubled in volume before adding the melted chocolate and butter. Chocolate! The quality of your chocolate matters here, there’s a lot of it in the batter (8 ounces!) so use a dark chocolate you’d like to eat on its own. No Dulcey? No Problem! If you can get your hands on some Dulcey chocolate from Valrhona, definitely take the plunge! It’s so delicious and caramely and totally worth trying out. If not, no problem. Just sub in some chopped white chocolate, or even milk chocolate, or leave it out all together! 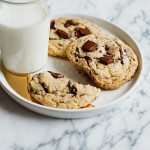 These cookies totally stand on their own with or without mix-ins. Whisk the flour, sifted cocoa powder, baking powder, and salt together in a bowl and set to the side. In a large microwave-safe mixing bowl melt the chocolate and butter together in 30-second intervals, stirring between each, until melted and smooth. While you melt the chocolate and butter, beat the sugar and eggs together in the bowl of a stand mixer fitted with the whisk attachment until doubled in volume, about 4 minutes. Slowly whisk in the vanilla and melted chocolate mixture to the sugar and eggs, followed by the flour mixture. The “dough” should resemble a thick brownie batter. Fold in the dulcey feves. Scoop the dough using a cookie scoop onto the lined baking sheets and bake each, one at a time, for 11-12 minutes. The cookies should be cracked and shiny, but dry to the touch. Cool on the pans for 5 minutes before transferring to a cooling rack to cool completely. The cookies will deflate slightly as they cool. This looks so good. Thank you for sharing. Going to try this soon.